Background and objectives Infections caused by multidrug-resistant organisms and Clostridium difficile are associated with substantial morbidity and mortality as well as excess costs. Antimicrobial exposure is the leading cause for these infections. Approximately 30% of antimicrobial doses administered in outpatient hemodialysis facilities are considered unnecessary. Implementing an antimicrobial stewardship program in outpatient hemodialysis facilities aimed at improving prescribing practices would have important clinical and economic benefits. Design, setting, participants, & measurements We developed a decision analytic model of antimicrobial use on the clinical and economic consequences of implementing a nationwide antimicrobial stewardship program in outpatient dialysis facilities. The main outcomes were total antimicrobial use, infections caused by multidrug-resistant organisms and C. difficile, infection-related mortality, and total costs. The analysis considered all patients on outpatient hemodialysis in the United States. The value of implementing antimicrobial stewardship programs, assuming a 20% decrease in unnecessary antimicrobial doses, was calculated as the incremental differences in clinical end points and cost outcomes. Event probabilities, antimicrobial regimens, and health care costs were informed by publicly available sources. Results On a national level, implementation of antimicrobial stewardship programs was predicted to result in 2182 fewer infections caused by multidrug-resistant organisms and C. difficile (4.8% reduction), 629 fewer infection-related deaths (4.6% reduction), and a cost savings of $106,893,517 (5.0% reduction) per year. The model was most sensitive to clinical parameters as opposed to antimicrobial costs. 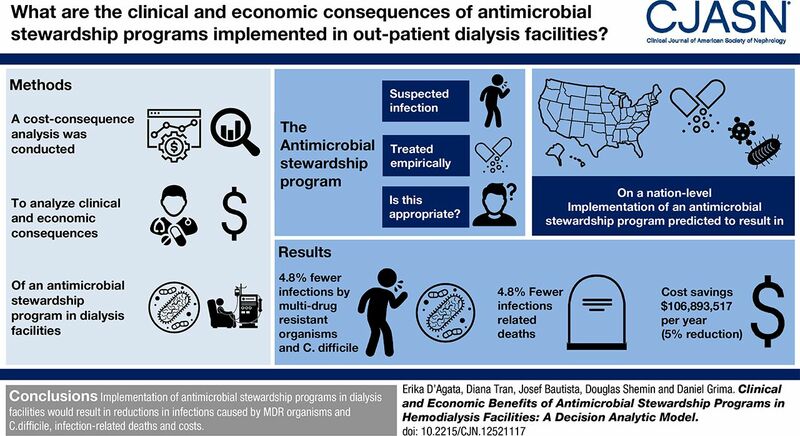 Conclusions The model suggests that implementation of antimicrobial stewardship programs in outpatient dialysis facilities would result in substantial reductions in infections caused by multidrug-resistant organisms and C. difficile, infection-related deaths, and costs. Rates of colonization and infection with multidrug-resistant organisms are among the highest in the maintenance hemodialysis population (1–4). Infections caused by multidrug-resistant organisms are associated with substantial morbidity and 30% mortality (5,6). Antimicrobial exposure is the main risk factor for the acquisition and dissemination of multidrug-resistant organisms. Among the maintenance hemodialysis population, up to 30% of prescribed antimicrobials are not indicated, are not necessary, or are suboptimal in choice (7). Optimizing antimicrobial prescribing patterns is, therefore, critical in curtailing the prevalence of multidrug-resistant organisms in this patient population. Antimicrobial stewardship programs have been developed and implemented in various health care settings to improve antimicrobial prescribing patterns. These programs were shown to decrease antimicrobial use by 20%–50% with substantial benefits in clinical outcomes, including reduced rates of infections caused by multidrug-resistant organisms, infection-related mortality, and adverse drug events (8–13). Substantial cost savings have also been documented (14). The goal of this study was to develop a health economic model to quantify the clinical and economic consequences of antimicrobial stewardship programs implemented nationwide in outpatient dialysis facilities with a focus on total antimicrobial use, infections caused by multidrug-resistant organisms and Clostridium difficile, infection-related mortality, and total costs. A cost consequence analysis was conducted from the United States perspective to quantify the benefits of implementing an antimicrobial stewardship program in outpatient hemodialysis facilities. The decision analytic tree was developed in Microsoft Excel 2010. The model structure was designed to be consistent with the general clinical principles of infection treatment in outpatient dialysis facilities. The methodology for designing decision trees is described elsewhere (15). Within the decision tree, treatment outcomes are represented by a series of pathways composed of decision nodes and emanating branches, representing a series of logically ordered alternative events or options. Each mutually exclusive branch in a decision node is assigned a transition probability, such that all probabilities for a given decision node sum to one. The expected values of each pathway are analyzed at the terminal node and calculated by sequentially multiplying the probabilities and applying the associated per-patient costs for each outcome. The clinical and economic effects of an antimicrobial stewardship program were calculated over a 1-year period. Figure 1 depicts the decision tree repeated in parallel for a scenario that simulated a preintervention reference strategy of current care and a postintervention scenario that simulated the implementation of the program. Decision analytic tree simulates antimicrobial use under scenarios with and without an antimicrobial stewardship program. A, appropriate; CDI, Clostridium difficile infection; I, inappropriate; MDRGN, multidrug-resistant Gram negative; MDRO, multidrug-resistant organism; MRSA, methicillin-resistant Staphylococcus aureus; VRE, vancomycin-resistant enterococci. Patients receiving outpatient hemodialysis enter the model when they have a suspected infection (bloodstream infection, pneumonia, urinary tract infection, and skin or soft tissue infection) and are treated with antimicrobials empirically. Empirical doses may be appropriate or inappropriate on the basis of whether national guidelines met criteria for suspected infection, while awaiting final microbiology reports. Details pertaining to the criteria for inappropriate prescribing are reported in the work by Snyder et al. (7). Once available, patients continue to receive antimicrobials for infection treatment. These continuing doses may be appropriate or inappropriate on the basis of laboratory confirmation and clinical criteria for the infection. Continuing doses were also categorized as inappropriate if the antimicrobial was not de-escalated on the basis of the antimicrobial susceptibility pattern of culture results. For example, a continuing dose was deemed inappropriate if a patient with a methicillin-susceptible Staphylococcus aureus bloodstream infection continued to receive vancomycin when microbiology reports showed cefazolin susceptibility or if the patient continued to receive third/fourth generation cephalosporins (ceftazidime/cefepime) for Gram-negative bacterial infections when microbiology reports showed susceptibility to cefazolin. Because of antimicrobial exposure, patients then become colonized with a multidrug-resistant organism; they can subsequently develop an infection caused by a multidrug-resistant organism or a C. difficile infection, and they can survive or die as the final outcome. Antimicrobials considered in the model were vancomycin, cefazolin, third/fourth generation cephalosporins, gentamicin, daptomycin, and carbapenems (16). The model compares the scenarios without and with an antimicrobial stewardship program that decreases inappropriate antimicrobial doses by 20%. Outputs included antimicrobial costs incurred in the dialysis facilities, occurrence of infections caused by multidrug-resistant organisms and C. difficile and associated mortality, and infection-related costs. Data were reported as mean values. Event probabilities related to antimicrobial dose appropriateness, colonization with multidrug-resistant organisms after antimicrobial exposure, infections caused by C. difficile or multidrug-resistant organisms, and mortality in the maintenance hemodialysis population were obtained from the published literature and opinion from a clinical expert (D.S.). All probabilities were transformed to match the annual cycle length of the model (Table 1). The incidence rate of suspected infections and mean 12-month event probabilities of antimicrobial appropriateness of empirical and continuous doses were derived from a cohort study, which quantified and characterized inappropriate antimicrobial use in outpatient dialysis facilities (7). During the study period, there were 70 empirical doses prescribed and 2549 patient-months (or 212.417 patient-years) of follow-up. Thus, 32.95% of patients on maintenance hemodialysis in 1 year had a suspected infection that required empirical treatment. Published results were used to inform the mean 12-month event probabilities of de novo colonization with multidrug-resistant organisms, including vancomycin-resistant enterococci, methicillin-resistant S. aureus, or multidrug-resistant Gram-negative bacteria, and C. difficile, as well as noninfection and multidrug-resistant organism infection-related mortality (1–3,5,6). It was assumed that the risk of C. difficile infection was higher with antimicrobial-exposed patients than with unexposed patients (6). Additionally, the probabilities of colonization with multidrug-resistant organisms increased with antibiotic exposure. Probabilities of colonization with multidrug-resistant organisms were derived using the calculated relative risks for de novo colonization and C. difficile infection using published methodology (22). A simplifying assumption was that coinfection with multidrug-resistant organisms and C. difficile was not allowed in the model. It was assumed that the probabilities of infection and mortality from multidrug-resistant Gram-negative bacteria were the lower estimates of the probabilities for infections caused by vancomycin-resistant enterococci and methicillin-resistant S. aureus due to lack of publicly available data on the risk of infections caused by multidrug-resistant Gram-negative bacteria in the maintenance hemodialysis population. Patients who did not develop an infection caused by multidrug-resistant organisms or C. difficile or those who survived their infections were still at risk of dying as per general maintenance dialysis mortality rates (6). Lastly, because of the lack of data pertaining to outpatient treatment and costs of infections in the dialysis population, it was assumed that infections caused by multidrug-resistant organisms or C. difficile required a hospital admission. Drug costs were taken from RED BOOK (23) (Table 2). Data pertaining to antimicrobial types administered in the dialysis facilities were obtained from the literature and used to derive costs of empirical and continuing doses (7). It was assumed that choice of empirical therapy and therefore, costs were the same for both appropriate and inappropriate administration of an empirical regimen, because inappropriate indication reflected unnecessary prescribing as opposed to inappropriate type of antimicrobials. Types of antimicrobials administered as inappropriate continuing doses were the same as those chosen for the empirical regimen, because it was assumed that the regimen would not change. Appropriate continuous dosing was calculated by adjusting the inappropriate treatment regimen to reduce the usage of vancomycin and third/fourth generation cephalosporins on the basis of data showing that 64.9% of empirical vancomycin and 35.1% of empirical third/fourth generation cephalosporins should have been narrowed to cefazolin (7). Infection treatment costs within the outpatient dialysis unit (therefore not requiring hospitalization) included two empirical doses and nine continuing doses (7) (Supplemental Table 1). The decision analytic model took into consideration the total hospitalization costs per admission due to nonfatal and fatal infections caused by multidrug-resistant organisms and C. difficile (Table 1). Data sources to inform the infection costs were chosen to match the maintenance hemodialysis population. In instances where the populations were nonsurgical inpatients, it was assumed that these published cost estimates would be the same as for hospitalized patients on hemodialysis. Costs were converted and inflation was adjusted to 2016 United States dollars using the medical care component of the Consumer Price Index. Costs and health benefits were not discounted, because the analysis was restricted to a 1-year time horizon. Univariable sensitivity analyses were conducted on the modifiable cost and probability inputs to identify key model drivers of the results. The parameters were varied by 20% to produce lower and higher values around the mean. Each value was tested one at a time, whereas all other model inputs remained at the default estimate. A tornado diagram was generated to graphically illustrate the effect of each sensitivity analysis on total incremental costs. To assess parameter uncertainty, a probabilistic sensitivity analysis was performed with 1000 model iterations. Default parameters were sampled from distributions on the basis of their SEM where available or by an assumed 10% variance; β-distributions (bounded by zero and one) were used for probabilities, and γ-distributions (bounded by zero and infinity) were used for costs (Supplemental Table 2). A scenario analysis was also explored to investigate the cost consequence of an ideal world with strict compliance to antimicrobial stewardship, where the program was associated with an absolute effectiveness rate of 100%. According the US Renal Data System records, there was a total of 365,566 patients with ESKD receiving outpatient hemodialysis in the United States in 2009 (16). In total, 120,454 suspected infection cases in the 1-year time horizon were estimated by multiplying 365,566 patients by 32.95 suspected infections per 100 patients (7). The model estimated that over 1 million doses were prescribed for suspected infections in 1 year, of which >491,000 doses were considered inappropriate (Table 3). The total annual drug costs for antimicrobials to appropriately and inappropriately treat 120,454 suspected infections in the preintervention period were estimated to be $39,147,993 and $47,230,307, respectively (Table 3). In total, 45,474 confirmed infections were projected among the 365,566 patients on hemodialysis at a total annual cost of $2,066,882,878 (Table 3). This total cost considered the hospitalization costs for nonfatal and fatal infections caused by multidrug-resistant organisms and C. difficile. Therefore, from a United States national perspective, the overall drug and resource use cost incurred per year of treating all outpatients on maintenance dialysis (including costs of antimicrobials administered in the dialysis unit) was $2,153,261,178 (Table 4). Introducing an antimicrobial stewardship program that reduced inappropriate prescribing by 20% led to a decrease in administered antimicrobial doses from 1,076,366 doses to 1,010,524 doses, and the total annual cost to treat suspected infections decreased from $86,378,300 to $75,028,266. The incremental difference in total annual costs (for all antimicrobial doses used) was −$11,350,034 per year due to a total reduction of approximately 65,843 empirical and continuous antibiotic doses over 12 months (Table 3). Implementation of the antimicrobial stewardship program led to 2182 fewer C. difficile and multidrug-resistant organisms infections and 629 fewer infection related deaths in 1 year, representing an overall 4.8% reduction in infections and 4.6% reduction in mortality relative to a scenario without the program. The total annual costs incurred to treat infections caused by multidrug-resistant organisms and C. difficile without and with the antimicrobial stewardship program were estimated to be $2,066,882,878 and $1,971,339,395, respectively, with an incremental difference in total annual costs of −$95,543,483 per year (Table 3). Table 4 summarizes the potential overall benefits of implementing the program in all outpatient hemodialysis facilities, including both costs associated with infections and antimicrobial costs administered in the facilities. Sensitivity analyses showed that changes to the noncost inputs had the most considerable effect on the incremental cost result (Figure 2). The most substantial effects were from any inputs that increased either the number of treated patients (i.e., probability of first dose for a suspected infection, probability of empirical or continuous treatment being appropriate, and probability of acquiring an infection) or the number of high-cost infections (i.e., probability of acquiring de novo colonization with multidrug-resistant organisms given antimicrobial exposure). The model was minimally sensitive to cost parameters. Tornado diagram displaying the univariable sensitivity analysis results (with ≥1% change around the base case) shows that the total annual incremental cost results are more sensitive to changes in event probabilities than to cost parameters. Parameters were tested with values that were 20% higher or lower than the base case. CDI, Clostridium difficile infection; MDRGN, multidrug-resistant Gram negative; MDRO, multidrug-resistant organism; MRSA, methicillin-resistant Staphylococcus aureus; VRE, vancomycin-resistant enterococci. A, B, E–J, and O, see Table 1 and Figure 1. Results from the probabilistic sensitivity analysis showed that cost savings were achieved in all model runs. The mean probabilistic incremental cost was −$106,947,853 (95% confidence interval, −$105,900,764 to −$107,994,943). An exploratory scenario analysis was conducted under the assumption that the antimicrobial stewardship program is 100% effective. Results of this scenario analysis suggested that, if treatment with antimicrobials always followed best practices, there would be >319,700 fewer antimicrobial doses, 6593 fewer infections (−14.5%), 1902 fewer infection-related deaths (−13.8%), and a net cost savings of >$300 million per year (Figure 3). Scenario analyses of different antimicrobial stewardship program effectiveness rates show greater cost savings in United States dollars (USD) and higher numbers of infections and infection-related deaths avoided with increasing program effectiveness. Over 30% of antimicrobials prescribed to patients on outpatient hemodialysis are deemed unnecessary on the basis of national consensus guidelines (7). Overuse of antimicrobials leads to an increase in infections caused by multidrug-resistant organisms and C. difficile, mortality, and costs. In this study, a health economic model that considered clinical and cost consequences of implementing antimicrobial stewardship programs in outpatient hemodialysis clinics from a United States national perspective was developed. The model estimated that reducing unnecessary antimicrobial use by 20% during a 1-year period prevented over 2000 (4.8%) multidrug-resistant organism and C. difficile infections and over 600 (4.6%) infection-related deaths, with a cost savings of over $100 million. The efficacy of antimicrobial stewardship programs in other health care settings ranges from 20% to 50%. In this study, we used the conservative estimate of 20% reduction. With an estimated 50% reduction, a total of 4645 (10.2%) infections and 1340 (9.8%) related deaths, respectively, would be prevented at a cost savings of $228,698,572. 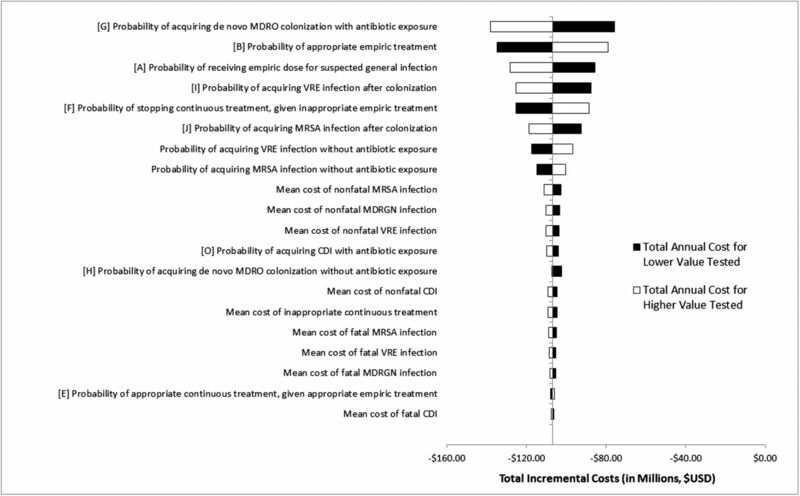 The model was most sensitive to changes in clinical input parameters, including probabilities of acquiring de novo colonization with multidrug-resistant organisms given antimicrobial exposure, empirical and/or continuous antimicrobial treatment being appropriate, and acquiring a multidrug-resistant organism infection; it was least sensitive to assumptions regarding actual costs of antimicrobials. These findings emphasize the importance of reducing unnecessary antimicrobial use and its negative downstream effects. In addition, although not addressed in this study, increased compliance with preventive measures focusing on limiting patient-to-patient spread of multidrug-resistant organisms and therefore, de novo acquisition as well as reducing the rates of infections would contribute substantially to greater improvement in clinical outcomes and reduction of costs. Substantial resources outlining the strategies toward implementing antimicrobial stewardship programs are available from the Centers for Diseases Control and Prevention, the Infectious Disease Society of America, and the Society of Healthcare Epidemiology of America (24–26). Although these resources do not specifically target the outpatient dialysis setting, many strategies can be adapted to outpatient dialysis facilities (27). Prioritizing specific interventions aimed at reducing antimicrobial use is one of the many recommendations. In outpatient dialysis facilities, focusing on the most commonly prescribed antimicrobials would be an important targeted intervention. The model showed that decreasing unnecessary doses of the three most frequently prescribed antimicrobials—vancomycin, broad-spectrum cephalosporins, and cefazolin—was associated with the largest increases in benefits. Thus, a strategy for antimicrobial stewardship programs in outpatient dialysis facilities could include focused efforts to de-escalate or discontinue these antimicrobials. For example, in a patient with an infection caused by methicillin-susceptible S. aureus, vancomycin would be discontinued and replaced with cefazolin. This type of de-escalation is especially important, because treatment of methicillin-susceptible S. aureus infections with cefazolin is associated with better outcomes than treatment with vancomycin (28–30). Another type of de-escalation would target switching from a broad-spectrum cephalosporin to cefazolin in a patient with an infection caused by cefazolin-susceptible Gram-negative bacteria. Discontinuing cefazolin, when not indicated, would be another area of focus. One of the most frequent reasons for unnecessary cefazolin exposure is in the treatment of a presumed skin and soft tissue infection that, in fact, is not a true infection (7,31). Antimicrobial stewardship programs could, therefore, also focus on educational efforts pertaining to the diagnosis and treatment of skin and soft tissue infections in this population using published national consensus guidelines (31). Limitations of this analysis are primarily related to sources of data, leading to a lack of generalizability of the model results to all outpatient dialysis clinics in the United States. First, probabilities of inappropriate prescribing behavior and antimicrobial appropriateness used to inform the model were taken from the only publication available that addressed all types of antimicrobials in two outpatient hemodialysis facilities. Second, some of the probabilities for infection and mortality rates were obtained from hospital-based data and may not necessarily be representative of the maintenance hemodialysis population. Third, several assumptions were required to address data gaps, although all assumptions were confirmed with a clinical expert to ensure face validity. For example, the decision tree included some simplifying assumptions, including exclusion of coinfection with multidrug-resistant organisms and C. difficile, which may not reflect the complexity and heterogeneity of infection management in clinical practice. Fourth, it was assumed that the cost estimates for general hospital inpatients would be the same as for hospitalized patients on maintenance hemodialysis. Because hospitalized patients on hemodialysis incur higher total costs compared with other hospitalized patients, the estimated cost savings could be even greater (19). Fifth, the cost of implementing an antimicrobial stewardship program was not included in the model, because it was assumed that this initiative would be considered a component of quality improvement initiatives and that costs incurred would be pertaining to resources for the leader of the antimicrobial stewardship program (27). The primary benefit of any model is that it supports clinical decision making using a transparent process and is a tool that allows exploration of the effect of parameter uncertainty. The need for such a model in medical decision making is well established, and it is borne from the need to make resource allocation and clinical management decisions in the absence of complete clinical data. Such tools have been widely used in general health care decision making and specifically used in the evaluation of infection treatment strategies (20,32–34). The main limitation of any model is that it combines data from multiple sources and requires assumptions regarding the comparability of data. This study is, therefore, a useful tool for decision makers conducting hypothesis generation and testing, and it can guide future research activities, including probabilistic sensitivity analyses. This study provides evidence that the clinical and economic benefits from implementing an antimicrobial stewardship program could be substantial for the population on maintenance hemodialysis and the health care system. Developing and implementing an antimicrobial stewardship program in outpatient dialysis facilities should be strongly considered. This work was supported by Agency of Healthcare Research and Quality grant R18 HS021666 (to E.M.C.D.) and National Institute of Allergy and Infectious Diseases grant K24 AI119158 (to E.M.C.D.). This article contains supplemental material online at http://cjasn.asnjournals.org/lookup/suppl/doi:10.2215/CJN.12521117/-/DCSupplemental.